There isn’t any challenge and mystery to fly fishing for pike. 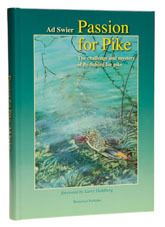 It is a tiny subject that has been so thoroughly dissected since the first books were written about it that there is nothing left to say on the matter – on the contrary we now know far too much and anyone submitting further manuscripts about pike and flies should be boiled in oil. Or that is what I thought, until I read Ad Swier’s book. I gather that we owe a good deal to various editors, not least our very own Chris McCully, but Passion for Pike is absolutely unique among its peers in that it is (a) interesting and (b) doesn’t prattle on for page after page about gear and bellyboats. The book is beautifully illustrated with Ad’s photographs, paintings and drawings and best of all, there are hardly any patterns in it and only one set of tying instructions, which is right at the end and actually left me wanting to learn more. The text mesmerised me: for a start, Ad is incapable of sticking to any subject for more than ten seconds, so it wanders all over the shop; it isn’t didactic; in places Passion for Pike reads more like a novel; there is a ghost story; and I haven’t enjoyed reading a book of any description so much in a long while. ‘Unusual’ is the best word to describe it, although ‘barking’ would be more appropriate and you will love it even if you don’t ever fish for pike. I think it is truly great, but I would grant that if you belong to the completer-finisher end of the personality spectrum it is liable to irritate you to death. Ad, let's see some more - get in there!